Keith Busey's 70's Best features musical director and bass player extraordinaire Keith Busey along with his outstanding band The Unit performing the best music from the 1970's and on this show presenting superb vocalists H.A.L.O., Fresh & Silk Soul for a fantastic night of music on Easter Sunday! During his brilliant musical career, Keith Busey has been musical director for several of the biggest R&B acts from the 1970's including The Stylistics, The Emotions, Heat Wave, Harold Melvin's Blue Notes and The Intruders. He was also musical director for the popular 70's Soul Jam concert series as well as performing for major artists and concert events as one of the very best bass players around. 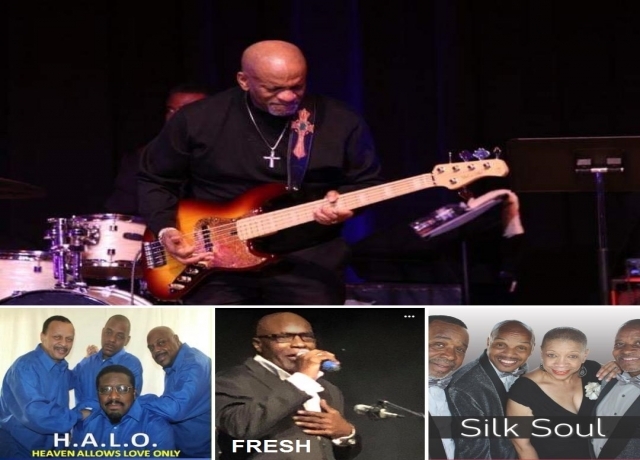 H.A.L.O., Heaven Allows Love Only, features John "Bo" Sharpe, Ivan "Dean" Cavanaugh, Curtis "Blow" Warren and Antwan "Silky" Drayton, best known for their wonderful live performances that always receive a standing ovation. Fresh is a talented and soulful male singer whose performances of classic songs by the late great Teddy Pendergrass leave audiences in amazement. Silk Soul features Janet Perry who is the "Silk" of the "Soul", Joe Bellows bellowing out strong vocals, Tyrone Crayton delivering smooth vocals and Ronald Queen, the "firecracker" of the group with a first tenor that is second to none.